Suffolk House Antiques | A small James I oak chest. A SMALL JAMES I OAK CHEST. Just in a good early 17th century oak chest with a two panelled moulded edge top, front and back. The stiles have stop chamfer mouldings. Excellent untouched colour. 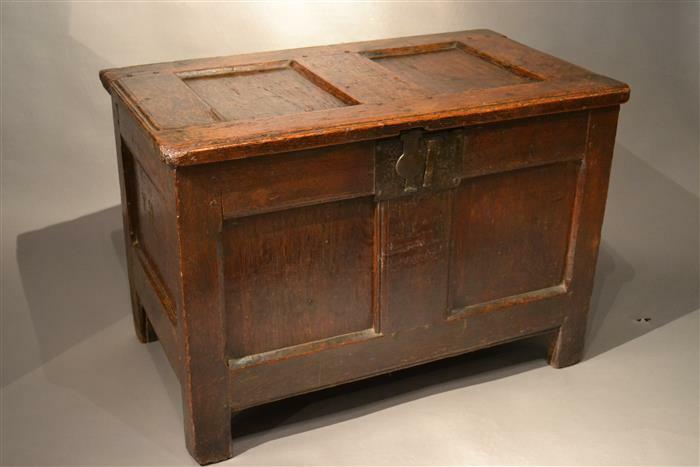 A very similar chest but with a plank top was sold lot 240 in the Clive Sherwood Collection 2002 when it fetched £3525. 31 1/2 inches wide x 18 1/2 inches deep x 21 1/2 inches high. It is attractively priced a t £1250. 04 Apr 2019 A VERY ATTRACTIVE OAK DRESSER BASE. 04 Feb 2019 THAMES VALLEY WINDSOR CHAIRS. 07 Jan 2019 SMALL TABLES FLAVOUR OF THE MONTH. 29 Oct 2018 CHRISTMAS EXHIBITION 2018 CATALOGUE NOW ONLINE. 08 Oct 2018 AN EXCEPTIONALLY SMALL OAK BUREAU BOOKCASE. 31 Aug 2018 AN UNUSUAL OAK DRESSER AND A DEUDARN JUST ADDED. 14 Jul 2018 FIVE INEXPENSIVE PIECES OF STOCK. 05 Mar 2018 A FINE STUART ROYAL ARMS CAST-IRON FIREBACK. 12 Feb 2018 A VALENTINE'S DAY PRESENT. 16 Jan 2018 NEW ADDITIONS TO THE WEBSITE. 06 Jul 2017 A SUPERB LATE 17TH CENTURY WELSH FARMHOUSE TABLE. 14 Apr 2017 A GOOD FRIDAY OFFERING. 20 Feb 2017 AN IMPRESSIVE EARLY 18TH CENTURY OAK LOW DRESSER. 06 Feb 2017 TWO WELL PRICED GEORGIAN OAK DRESSER BASES. 10 Jan 2017 A GOOD WILLIAM AND MARY OAK GATELEG TABLE. 09 Aug 2016 TWO MORE OIECES JUST ADDED. 30 Jul 2016 TWO GOOD OLD FASHIONED PIECES OF EARLY OAK. 11 Jul 2016 A CHARLES II OAK LOW DRESSER. 04 Jul 2016 A WONDERFUL WILLIAM AND MARY OAK REFECTORY TABLE. 20 Jun 2016 TWO REALLY GOOD GEORGIAN DRESSERS. 28 Apr 2016 SUMMER SELLING/25TH ANNIVERSARY EXHIBITION. 15 Apr 2016 AN EXTRAORDINARY SET OF 17 18TH CENTURY CHAIRS. 22 Mar 2016 A CAST IRON FIRE BACK DATED 1641. 25 Feb 2016 AN EARLY OAK ANGEL AND A CHARLES I BOARDED CHEST. 13 Feb 2016 A SUPERBLY PATINATED GEORGE III PINE DRESSER. 25 Jan 2016 A MID 17TH CENTURY OAK THREE TIER BUFFET. 11 Jan 2016 A FINE CHARLES I OAK SOMERSET COFFER. 08 Sep 2015 TWO PRESS CUPBOARDS AND A SMALL COFFER. 10 Jul 2015 A FINE WALNUT ARMCHAIR AND A GOOD OAK CANDLESTAND. 27 Jun 2015 A WONDERFUL ITALIAN STONE WELL HEAD. 08 Jun 2015 A SUPERB BURR WALNUT CHEST OF DRAWERS. 21 Apr 2015 A 16TH CENTURY ITALIAN WALNUT CREDENZA. 28 Mar 2015 A FINE YEW WOOD "BEST CHAIR". 30 Jan 2015 A SMALL CHARLES II OAK PRESS CUPBOARD. 13 Jan 2015 TWO INTERESTING PIECES OF EARLY OAK FURNITURE. 17 Oct 2014 A RARE SET OF SIX WELSH OAK CHAIRS. 04 Aug 2014 TWO GOOD PIECES OF MID 17TH CENTURY OAK FURNITURE. 08 Jul 2014 A RARE, POSSIBLY MEDIAEVAL, LOW TABLE. 01 Jul 2014 A MID 17TH CENTURY OAK FORM OR BENCH. 12 Jun 2014 TWO PIECES OF 17TH CENTURY OAK FURNITURE. 24 Mar 2014 ONE REFECTORY TABLE COMES IN AS ANOTHER GOES OUT! 01 Mar 2014 A SMALL GEORGE III WEST COUNTRY DRESSER BASE. 01 Feb 2014 TWO FINE 17TH CENTURY TABLES. 25 Jan 2014 A JAMES I OAK MARQUETRY INLAID CHEST. 16 Jan 2014 A CHARLES II OAK TWO PART CHEST OF DRAWERS. 11 Oct 2013 A CHARLES I OAK MURAL SALT CUPBOARD. 09 Sep 2013 A CHARMING GEORGE II MAHOGANY CHEST OF DRAWERS. 05 Aug 2013 A SMALL CHARLES I OAK COURT CUPBOARD. 04 Jul 2013 LATEST STOCK TO GO ON THE SITE. 24 Aug 2012 A RARE CHARLES I CHILD'S CHEST.